If you haven't counted recently, it has been over 15 years since MasterCard, Visa and Europay developed EMV technology to make your credit cards more secure, but has yet to catch on here in the US. However, that is about to change. MasterCard has created a master plan to help usher in the EMV era and sound the death knell for the magnetic strip. But why? The EMV infrastructure is far more fraud-resistant because each transaction is authenticated dynamically using cryptographic algorithms and a user-specific PIN. That's why MasterCard plans to help build out the EMV POS infrastructure by April of next year and have its secure e-payment system functioning at ATMs, online and with its myriad mobile payment options as well. There are a few details from the credit firm about how they plan to move these plans into effect. More details are coming, but for now, you can soak in the press release embedded below. PURCHASE, N.Y.--(BUSINESS WIRE)--MasterCard today introduced a comprehensive roadmap focused on advancing the U.S. electronic payments system. The roadmap, which includes the path for migration from magnetic stripe to EMV technology currently available on "chip" cards, will serve as the foundation for the next generation of products and services developed to enhance the way consumers pay. As payments continue to evolve to include new devices and new channels, such as mobile and eCommerce, the roadmap takes steps to address how consumers really shop, providing them greater security and control in their payment choices and the potential to seamlessly integrate loyalty programs and offers into the purchasing experience. "We're moving toward a world beyond plastic, where consumers will shop and pay in a way that best fits their needs and lifestyles with a simple tap, click or touch in-store, online or on a mobile device," said Chris McWilton, President, U.S. Markets, MasterCard. "Our roadmap represents a transformational shift in the approach to payments and is not simply about EMV, chip and PIN. We're focused on readying the ecosystem to drive future innovation and provide new consumer experiences to enhance the value of electronic payments. " In implementing the roadmap, MasterCard will maximize the technology advancements and investments the company has made over 45 years to benefit the payments ecosystem. "Customers from across the payments ecosystem have been asking for a roadmap," said McWilton. "We believe we've provided issuers and merchants with a vision to 'future proof' their businesses and the flexibility to manage their technology decisions to best meet their goals and priorities." In the increasingly digital world, transactions will get smarter. At the heart of this is dynamic authentication, where each transaction incorporates unique information, making it virtually impossible to replicate and reducing the risk of fraudulent transactions. As issuers evolve their offering and merchants upgrade their terminals, the payments system will become more secure as this dynamic data is introduced into the payment transaction. MasterCard's roadmap strongly encourages the adoption of the most secure technologies available. "Consumers deserve a great experience any time they use MasterCard products," said Ed McLaughlin, Chief Emerging Payments Officer, MasterCard. "As the industry invests in the upgrade to EMV in the U.S., we now have the ability to enhance the consumer experience and the security of a payment, regardless of the device – contactless card, mobile, eCommerce and technologies still to come." In its roadmap, MasterCard supports the need for the payments ecosystem to be aligned regarding the implementation of EMV standards in the U.S. The company has indicated it will support current industry timelines in an effort to minimize disruption and to maximize investments across the payments ecosystem. MasterCard was part of the original group that created the EMV standard and has supported the successful migration to EMV-based payments in nearly every major market globally. The company's continued investment in advancing these infrastructure standards has provided insights and expertise to guide the industry in advancing payments security and convenience. "The shift to dynamic data in the transaction process will help ensure greater consistency, security and functionality between the U.S. region and the rest of the globe," said George Peabody, director, Emerging Technologies Advisory Service, Mercator Advisory Group. "Merchants and issuers need a clear and consistent roadmap for payment card security and innovation. MasterCard's approach, starting with EMV, will benefit consumers and the industry." Additional detail on the roadmap and implementation activities will be provided to MasterCard customers in the coming weeks and months. 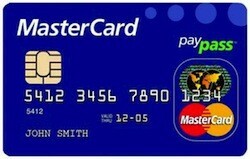 In the meantime, initial resources can be obtained at www.mastercard.us/mchip-emv.html.